JAPAN'S most enigmatic car maker, Honda is equally capable of stunning mediocrity - to wit, the Accord - and, just occasionally, divine inspiration. 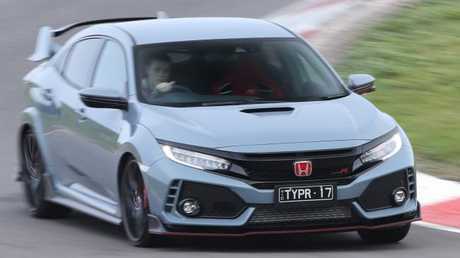 That's where we're at today, with the best car Honda has delivered for many years, the Civic Type R.
The Type R badge has adorned Honda's hot Civic hatch for 25 years and five generations in Japan and Europe but its only previous appearance here was brief, with the third generation model available from 2010-2012. 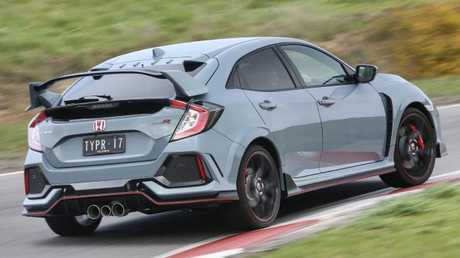 The Type R is a welcome return to form for Honda. Picture: Supplied. 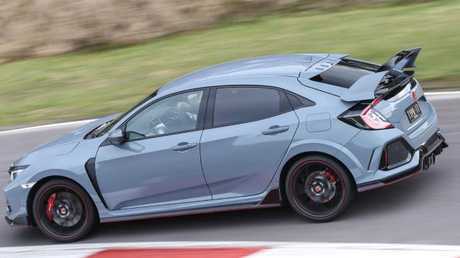 It goes up against a squadron of prime European machinery, including the class benchmark Golf GTI and R, Ford's Focus RS and new Renault Megane RS, due in a few months. Its only serious Japanese rival is Subaru's ever-lovely WRX STI. A new kid is lobbing on the block in the shape of Hyundai's much-hyped i30N. So if you like your performance cars small, light, mean and with front or all-wheel drive, you've now got a difficult decision to make. The Honda is as accomplished on the track as it is on the road. Pic: Supplied. 2.0-litre turbo four is certainly competitive. However, its 0-100km/h time of 6.2 seconds, as measured on satellite timing equipment by colleague Joshua Dowling, is a long way from the front row, where Golf R stops the clock at 4.9 seconds and Focus RS at 5.2 seconds. The Honda is quicker through the corners than it is off the mark. Picture: Supplied. But, of course, there's much more to an A-grade performance car than straight-line speed. 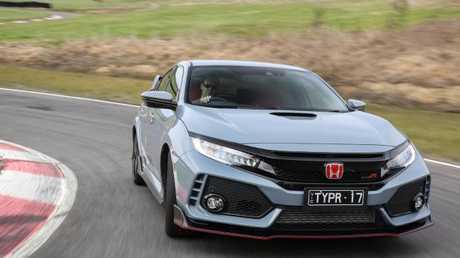 Honda runs variable valve timing and a single turbocharger on the 2.0-litre, its first foray into forced induction on a Type R. It's matched with a close ratio six-speed manual gearbox; there's no automatic option. Honda's ubiquitous Eco button doesn't get a start here, either. Wrong crowd. Comfort, Sport (default) and maximum attack +R modes adjust the suspension damping, steering geometry and accelerator response. The suspension and steering are adjustable. Picture: Supplied. You can also select rev matching, which automatically blips the throttle when you downshift. Pah! Real men and women heel and toe. Truth is, this is much easier. And smoother. One of the Type R's many attractions is that it's remarkably comfortable for a car that, to look at, suggests pain rather than pleasure. You sit in a full body wrap racing-style seat, with generous padding and contouring in the right places, so a long day's drive involves no discomfort at all. The cabin is suitably sporty. Picture: Supplied. It's complemented by suspension that is truly astounding in its compliance on the Comfort setting, and even on Sport, particularly when you consider that the car rolls on 20-inch alloys shod with 245/30 Continental rubber. I've tested quite a few SUVs that don't ride as comfortably as the Honda, both around town and at speed on country roads. The completely over the top hoonmobile exterior - which I reckon looks the business - cloaks a Civic hatch with reasonable rear seat and boot space, plenty of storage upfront, all the connectivity options, Honda's touchscreen infotainment (minus navigation) and bright, legible digital instruments. These include a huge speedo display. Very wise. 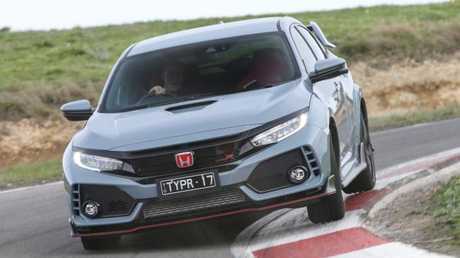 The Type R is no shrinking violet. Picture: Supplied. "Collision Mitigation" is Honda's version of autonomous emergency braking. You also get blind spot monitoring, via a camera on the passenger side, but nothing on the driver's side. Sometimes, Honda's lane keeping set-up works. Other times, it doesn't. I had expected the 2.0-litre to be a typical performance Honda - weak in the bottom half of the rev range and a screamer from about the 4000rpm mark - but it's surprisingly tractable from about 2500rpm in the higher gears, so the Type R is quiet, civilised and easy to drive around town. It kicks at 5000rpm, from where it pulls with greater urgency and hot-four soundtrack, to 7000rpm and the engine feels as though it's got more revs in it. At no stage, though, does the Honda launch itself at the horizon with that unstoppable turbo shove you get in the class front-runners. It's just not that fast. Steering feel is superb and the brakes are awesome. Picture: Supplied. The upside is that torque steer - the tugging at the wheel that compromises steering feel and precision - is relatively mild. Steering is superb, especially in Sport and +R mode, which quicken the ratio so the slightest flick of the wrists points the car exactly where you want it to go. This thing dives into corners with a completely neutral, flat attitude - the technical term is "chuckability" - and is a joy to adjust on the throttle. I've driven few front-wheel drive hot hatchbacks with so much front- end grip. Great brakes with four-piston Brembo calipers upfront put the icing on an outstanding dynamic package. My Dad drives a Golf GTI. 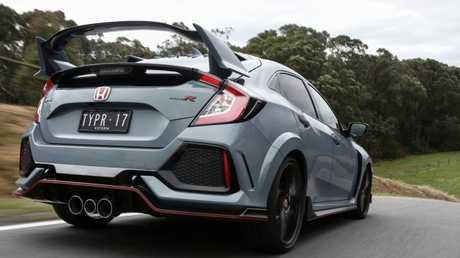 This looks much more my style and Honda's Type R badge has serious street cred. 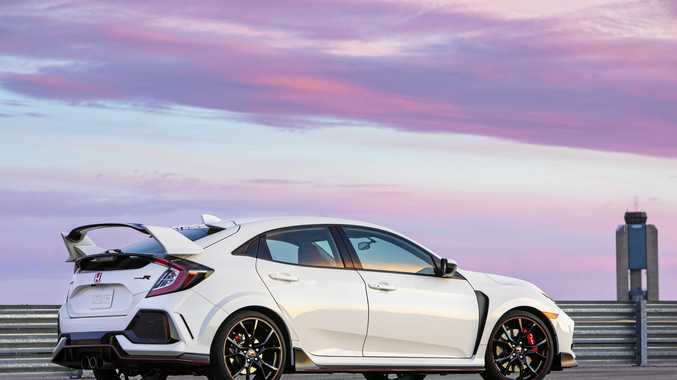 When Honda gets performance engineering right, it's as good as anything from Europe. This is Motor magazine's Performance Car of the Year, so it's a winner. The 221kW 2.5-litre turbo Rex is a blunt instrument but it's also fast (5.2 seconds to 100km/h claimed) and a refreshingly analog performance drive in this digital world. Unbeatable value for a 4.9 second performance hatch with 213kW 2.0-litre turbo/six-speed manual/all-wheel drive. Add the seven-speed DSG gearbox with paddle-shifters for $2500.